Take part in sightseeing in Kecskemét, a city full of museums, galleries and exhibitions. Taste one of the most well-known Hungarian drinks, the traditional Hungarian apricot brandy (pálinka), wines and traditional Hungarian cuisine. If you want to see horse shows, try horse riding, relax in saunas, Jacuzzis, steam baths, try massages, team building exercises. You can do all of this and more in Kerekegyháza, at the Varga Tanya Restaurant and Hotel, which is not far from Kecskemét. Kecskemét is known for its many museums, art nouveau architecture and for the fact that the world famous composer Zoltán Kodály was born here. A lot of musicians from all over the world come here to study his music. One of the most visited places is the Old Synagogue, which is a Moorish-style synagogue. Right across the street from the Old Synagogue is the Ornamental Palace (Cifra Palota), which was built in art noveau style, was built in 1902 and now houses the Kecskemét Gallery (Kecskeméti Képtár), where you will be able to see modern paintings as well. The Museum of Hungarian Naive Artists (Magyar Naív Művészek Múzeuma), where the exhibition has somewhat medieval or surreal paintings and sculptures. Another great museum is the Ráday Museum of Calvinist Ecclesiastical History, which includes a collection of clocks, an exhibit on chalices, a mineral collection and local sculptures. Besides the museums, there are several collections and exhibitions, such as an exhibition displaying pictures, music books and other items of Zoltán Kodály, which is located in the Zoltán Kodály Music-Pedagogy Institute. 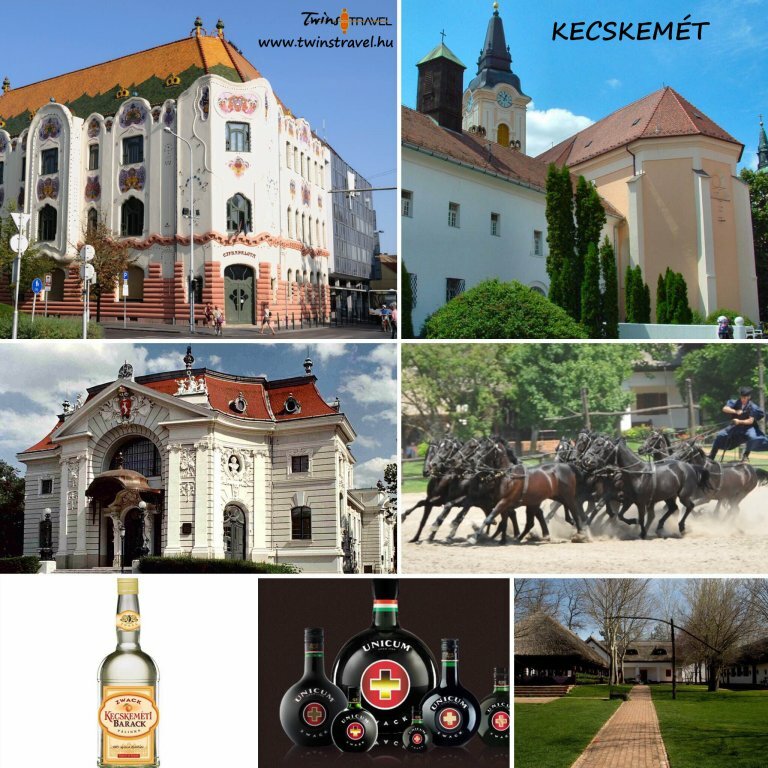 Moreover, there is the Bozsó Collection (Bozsó Gyűjtemény) of Hungarian folk art and the Zwack Fruit Brandy Distillery and Exhibition. Should you have eaten too much or should you have problems with your digestion, or migraine (blinding headache), drink one glass of the ZWACK UNICUM! It will help you, we can assure you. It’s the best and most famous Hungarian digestive made of 40 different herbs collected all over the world. If you do not wish to visit museums in Kecskemét, you could visit the County Hall inside, the beautiful building is the Katona József Theater and the Evangelical church and the Orthodox church. If you visit Kecskemét with your family, you will have a great time in the Kecskemét Wild Park, the Adventure Spa & Waterslide Park or in Kecskemét Baths. The Varga Tanya: typical restaurant on the Hungarian puszta: desert, hotel with wellness area and famous place with horse show in Kerekegyháza has been attracting visitors for almost 30 years. Here you can learn about Hungarian traditions, enjoy the traditional Hungarian horse shows, where the most outstanding performance is the puszta ten (one horseman rides ten horses at the same time). The Varga Tanya is reputable and has won the 5 horseshoe equestrian service provider qualification. At the Varga Tanya you will be able to taste pálinka: Hungarian apricot brandy, wines, try horse-riding, ride in a horse-cart, visit a homestead, the Tanya Museum and enjoy gipsy music while trying traditional Hungarian cuisine. The “puszta-program”: horse show is organized between April 1st and October 31st and starts every day at 11.00 a.m. – 11.30 a.m., with the horse-show beginning at 12.30 p.m.
At the Varga Tanya you can also try team building exercises and take part in the puszta-olympics, which include archery, horseshoe throwing, sack-race and more. You can even have your wedding here. The Varga Tanya has a peaceful atmosphere, a beautiful park and the church ceremony is nearby as well, the Puszta-church can house around 200 people. If you are interested in cultural programs or trying traditional Hungarian open-air activities, Kecskemét and the Varga Tanya are worth visiting.